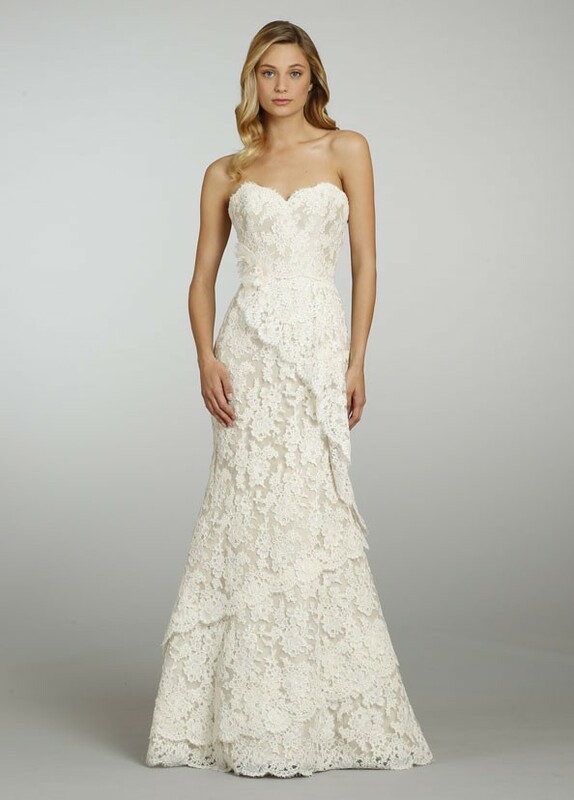 Soft fluted bridal gown with an Alencon lace overlay. Strapless sweetheart neckline with detachable Ivory satin ribbon and jeweled floral belt detail at natural waist. Covered buttons and loops to end of sweep train. I love the train on this dress. Not worn or tailored. Priced to sale. I love this dress, especially the train on the dress. Hopefully this can go to someone who will love it as much as me. This was not wore, but I did have extra padding put in the bust that can be removed. The original length was also not tailored. I am 5'8-5'9 with heels. The fabric of this dress allows you to tuck it in if too long without ruining the look. I believe this dress can fit up to 5'10-5'11 including heel height. The last three pictures are the pictures of the actual dress. Beautiful lace details with an amazing tiered train. If you love this dress, make me an offer. Happy wedding shopping!